If Credit is Not Created Out of Excess Reserves, What Does That Mean? We’ve all been taught that banks first build up deposits, and then extend credit and loan out their excess reserves. But critics of the current banking system claim that this is not true, and that the order is actually reversed. Central to [Keen’s] ideas is the concept that demand for credit creates loans which create reserves, which is the opposite causality of what one sees in neoclassical economics. “The modern banking system manufactures money out of nothing. The process is perhaps the most astounding piece of sleight of hand that was ever invented. – Sir Josiah Stamp, president of the Bank of England and the second richest man in Britain in the 1920s. Banks create money. That is what they are for. . . . The manufacturing process to make money consists of making an entry in a book. That is all. . . . Each and every time a Bank makes a loan . . . new Bank credit is created — brand new money. Recently, the vice president of one of the 3 biggest banks in America stated that the bank’s loan officers do not really check the bank’s deposits, reserves or capital base before making a loan. Indeed, some critics of the current banking system – like Ellen Brown – claim that the entire credit-creation system is an accounting sleight-of-hand, and that banks simply enter into loan agreements, and then obtain the reserves later from the Fed or in the open market. In other words, they claim that banks extend money first, and then increase their reserves on their books later to cover the loans. So what does it mean that loans and debt are created first, and then reserves and credit come later? First, it makes it less likely than most people think that the giant banks will increase the amount of money they’re loaning out to individuals and small businesses. Specifically, since loans are made before new infusions of government cash (Kydland and Prescott), there is not a simple cause-and-effect relationship. So the bailouts to the banks will not necessarily encourage them to make more loans. Indeed, the heads of the big banks have themselves said that they won’t really increase such loans until the economy fundamentally stabilizes (no matter how much money the government gives them). 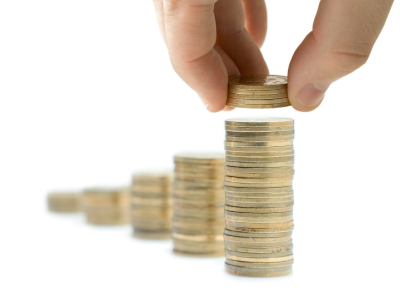 In practice, banks lend money and reserves come later. When defaults pile up, the Fed prints reserves to cover bank losses. 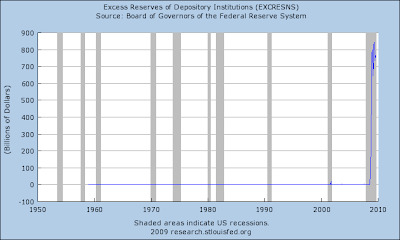 Thus, those “excess reserves” aren’t going anywhere. They are needed to cover losses. It’s best to think of those reserves as a mirage. They don’t really exist. Second, if banks won’t increase their lending in response to government funds, then that argues against inflation and for continuing stagnation in the economy. Third – going beyond what most economists believe or will publicly discuss (and going beyond what I have any background or inside information to confirm) – monetary reformers like Ellen Brown argue that the entire banking system is based upon a fraud. Specifically, she and other monetary reformers argue that the banks have intentionally spread the false reserves-and-credit first, loans-and-debt later story to confuse people into thinking that the banks are better capitalized than they really are and that the Federal Reserve is keeping better oversight than it really is. Moreover, many monetary reformers argue that the truth of loans-before-reserves is hidden in order to obscure the alleged fact that the entire financial system is built on nothing but air. Specifically, Brown argues that unless more and more debt is continually created, since money creation follows debt creation, what we think of as the money supply will shrink, and the economy will crash. In other words, they say that we a massive, ever-expanding debt bubble has been blown for many decades, and that the myth that banks make loans out of their excess reserves helps to fuel the bubble. Do the monetary reformers go too far? If so, what should the reality of the way credit is created mean for us and the stability of the economy?